Cosmopolis: A Novel - Kindle edition by Don DeLillo. Literature & Fiction Kindle eBooks @ Amazon.com. Switch back and forth between reading the Kindle book and listening to the Audible book with Whispersync for Voice. Add the Audible book for a reduced price of $11.49 when you buy the Kindle book. Now a major motion picture directed by David Cronenberg and starring Robert Pattinson, Cosmopolis is the thirteenth novel by one of America’s most celebrated writers. It is an April day in the year 2000 and an era is about to end. The booming times of market optimism—when the culture boiled with money and corporations seemed more vital and influential than governments— are poised to crash. 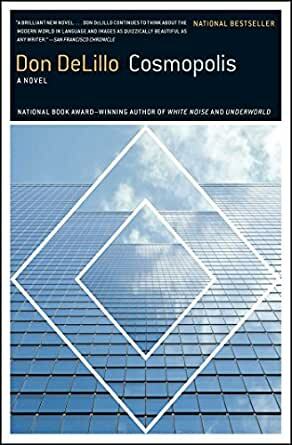 Eric Packer, a billionaire asset manager at age twenty-eight, emerges from his penthouse triplex and settles into his lavishly customized white stretch limousine. Today he is a man with two missions: to pursue a cataclysmic bet against the yen and to get a haircut across town. Stalled in traffic by a presidential motorcade, a music idol’s funeral and a violent political demonstration, Eric receives a string of visitors—experts on security, technology, currency, finance and a few sexual partners—as the limo sputters toward an increasingly uncertain future. Cosmopolis, Don DeLillo’s thirteenth novel, is both intimate and global, a vivid and moving account of the spectacular downfall of one man, and of an era. For a book about a 28-year-old new-economy billionaire with a "frozen heart," Patton adopts a distant, machine-like narrative tone that has all the warmth of the computer HAL in Stanley Kubrick's 2001. It's a fitting approach, as the asset manager at the novel's center, Eric Packer, is hardly an avaricious tycoon, but rather an insular and literate egotist who seems more given to detached, philosophical reveries on everyday trivialities than to serious business analysis. That, too, fits, as this novel from DeLillo (Underworld; White Noise) takes place entirely in one day as Packer's life unravels while he's driven across Manhattan to get a haircut. He remains aloof both to listeners and to those around him, and Patton's understated reading imbues the proceedings with the subtle edginess of a mild drug. That's not to say that things are completely monotone, though; Patton also deftly portrays characters ranging from Packer's gruff, paranoid head of security to his aging Italian barber, one of the few characters who seem truly human. But the book is really an extended meditation, and while Patton's pitch may be perfect, the recording isn't for everyone. Unlike his sprawling masterpiece, Underworld, DeLillo's 13th novel is short and tightly focused, indeed almost claustrophobic. Most of the action takes place inside a "prousted" (cork-lined) stretch limo, as the reclusive financial wizard Eric Packer is chauffeured across Manhattan for a haircut. Thanks to a presidential visit, antiglobalization demonstrations, and a celebrity funeral, this journey takes up most of the day. Stuck in traffic, Packer anxiously monitors the value of the yen on the limo's computer. Using the car as his office, he summons advisors from nearby shops and restaurants. His physician gives him a rubber-gloved physical exam in the back seat as Packer discusses imminent financial ruin with his broker and angry crowds block the streets. This work most closely resembles The Body Artist in its brevity and straightforward narrative flow. However, the earlier novel was written in an uncharacteristically warm, poetic style, promising a new direction for this important writer, while Cosmopolis reverts to the standard DeLillo boilerplate, perceptive and funny but also brittle and cold. This, coupled with the book's dated 1990s sensibility, makes Cosmopolis a step backward rather than an artistic advance. This novel has occasional lyrical power and is richly cerebral. The author presents a world stumbling inexorably toward the apocalypse and a protagonist bent on his own self-destruction. While reasons emerge in abundance for the social collapse, we are left to guess why the protagonist, the ultimate alpha-male narcissist, has decided to deepen the chaos and engineer his own ruin. The novel is episodic rather than organic. Has it been constructed of parts that don't fit together in order to mimic the author's vision of entropy? It seems rather to consist of a number of different fictions, or kernels of fictions, cobbled hastily together. Full of sound, fury, and pyrotechnics, but signifying . . . what? In Part One of COSMOPOLIS, DeLillo primarily examines the lives of two characters. The first and dominant character is Eric Packer, a young hedge fund manager worth tens of billions of dollars, who risks the complete loss of his fortune and fund if the Yen rises. Eric is at the nexus of capital and technology and believes that he can spot and profit from movements in money and information that are unseen by others. Says Eric: "There's an order at some deep level...A pattern that wants to be seen." Says Kinski, his Chief of Theory: "A consciousness such as yours, hypermaniacal, may have contact points beyond the general perception." Meanwhile, the second major character introduced in Part One is Benno Levin, a former trader and generic laborer at Packer Capital, who lost his job. Thinks Benno: "There are great themes running through my mind. The themes of loneliness and human discard. The theme of who do I have when there's no one left." In Part Two, DeLillo examines the tropism toward destruction and death in these two characters. In Eric's case, this tropism manifests as his huge bet on the Yen gradually sours. Then, DeLillo seems to ask: If a man like Eric can't win, will he attempt to take the system down with him? In contrast, the plight of Benno, who was trashed by Eric's cyber-capitalism, represents a different question. Namely: Is there anything a victim of capitalism can do that actually rights the ruthless wrongs inherent to the system? COSMOPOLIS is a surrealistic satire that is tersely hilarious. It begins with the sleepless Eric in his 48-room apartment near the FDR Drive, where he enjoys an atrium, screening room, and shark tank, and ends in an abandoned tenement near the West Side Highway where the characters have no roles to play in life. Along this riches-to-rags continuum, DeLillo supplies innumerable instances of amazing writing and insight. The man, truly, expands what you see. Here, for example, is Eric during his confrontation with Benno. "He'd always wanted to become quantum dust, transcending his body mass, the soft tissue over the bones, the muscle and fat. The ideas was to live outside the given limits, in a chip, on a disk, as data, in whirl, in radiant spin, a consciousness saved from void...It would be the master thrust of cyber-capital, to extend the human experience toward infinity as a medium for corporate growth and investment, for the accumulation of profits and vigorous reinvestment." This is not my favorite DeLillo novel. But COSMOPOLIS has great insight and style and is eerily prescient about risk taking on Wall Street, which, like the hubristic Eric Packer, is clearly willing to risk and embrace economic meltdown for big paydays. I read Cosmopolis because I had seen the movie (also hypnotic) and needed to get more background, as well as understand how Cronenberg used the words in the book to adapt it for a screenplay. This is definitely one of the odder books I have read recently, but I loved the wordplay and the insight into a somewhat psychotic mind. Yes, some of it is silly, but I think that if you can really get into Eric's head, the book is fascinating. He is someone trying to connect to reality rather than his own inner life (the only one he has). This is the first DeLillo novel I had read, so I cannot compare it to any other of his works. I feel that the movie itself, Cosmopolis, was very much misunderstood and poorly reviewed. Come on, forget that Robert Pattinson was in Twilight, and look at the movie for itself. Cronenberg is always a fascinating director, and all of the actors were superb. Pattinson and Giamatti towards the end of the movie are spellbinding in a ritual dance of cat and mouse (which is which, and when). Overall, a little Hamlet, and a lot of 21st century zeitgeitz. 4.0 out of 5 starsTypical DeLillo Book--a bit crazy, fun, and different all mixed together. I picked up Cosmopolis as part of my endeavor to get more into the writing of Don DeLillo and I came away impressed with the book and his interesting albeit sometimes herky-jerky style of writing. This book is about a man named Eric Packer who we find one early morning in New York trying to do two things: get a haircut and make a huge bet on the fall of the yen. The rest of the day (and the book) we find Eric driving around in the most tricked-out, secure, over the top limo (with a built in toilet) running into people who are all part of his life in some way and having brief interactions with them--most ending in some sort of sexual transaction. He does this with his employees, security guards, and his wife-although it is unclear if it is actually his current wife or ex-wife or mysteriously both. His car runs into odd protests and explosions around the city and a presidential motorcade. This is by far one of the oddest books I have read in some time. DeLillo is a genius writer but you have to concentrate pretty hard to really understand the message he is trying to get across. I enjoyed the book and recommend it. The first time I picked up Cosmopolis by Don DiLillo, I was only able to read a few pages before sitting it back on the shelf I'd picked it up from. I found what I'd read tedious, pretentious, and I had lost interest quickly. In the next few days I thought about the book and how I hate to start any book and not complete it. I needed to see where this tedious, pretentious story went. I started reading and found that it was the main character, Eric Packer who had those particular traits and more. One of his first pretentious and narcissistic utterances was, "When I die, it is the world that will stop, I will keep on going." He was a very pompous man, I thought. As I continued to read I adjusted to the story and the character. I began to understand Eric and those around him and why they acted the way they did. I really grew to appreciate the story and feel for the characters. I recommend this book to those who like contemporary writers and characters who think'beyond the box'. It wasn't an easy book to read, but it was extremely thought-provoking for me.